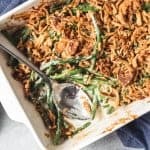 Fresh Green Bean Casserole covered in french fried onions is a creamy, classic Thanksgiving side dish that nobody seems able to resist despite full plates and full bellies! Preheat the oven to 375 degrees F. Heat a large pot of salted water to a boil. I aim for about 1 1/2 tablespoons of salt in a gallon of water, but usually just eyeball it. Prepare a large bowl with an ice bath for blanching the beans. Blanch the beans by adding them to the boiling water and cooking for 5 minutes. Then drain in a colander and immediately plunge the beans into a large bowl of ice water. This will stop the cooking process so the beans don't turn mushy. Drain and set aside. Melt the butter in a large skillet over medium-high heat. Add the onion and garlic, sauteing for 4 to 5 minutes until the onions start to soften. Add the mushrooms, salt and pepper and cook another 1 to 2 minutes. Sprinkle the flour over the softened onions and stir to combine. Cook for 2 minutes, then whisk in the chicken broth to make sure there are no lumps, then the half and half. Bring the mixture to a simmer and cook until it has thickened, stirring occasionally, about 6 minutes. Pour the sauce over the beans and stir to combine, then transfer to a large 9x13-inch casserole dish and sprinkle with the breadcrumbs and french fried onions. Bake for 20 minutes until hot and bubbly. Cover the dish with foil if the onions start to brown too quickly. Optional: If you want mushrooms in your green bean casserole, chop about 8 ounces of button mushrooms or 2 portobello mushrooms and add once the onions and garlic have been sauteed, before adding the flour. Recipe adapted slightly from The Novice Chef.